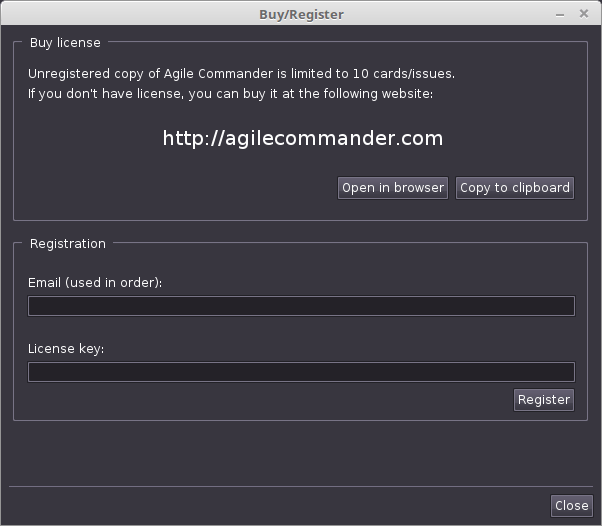 How to register Agile Commander? The Agile Commander program is Shareware program. An unregistered version is limited to 10 stories and can be used only for testing. To obtain licenses for using the program, you must purchase a license key. Please make sure to provide a valid e-mail address in license purchasing process. The license key will be sent to the provided e-mail address. You must enter the e-mail address used during the purchase process and the license key correctly. After provided correct data and clicking the Register button the application will be registered and the restrictions will be abolished.